Sooner or later you will end up with a flat tire on your Murray riding mower. You have a decision to make when changing the lawn mower tire. You can either purchase a replacement tire that is already mounted to a rim or you can simply remove the flat tire from your existing rim and place a new tire on the rim. It is less expensive to use your existing rim. Park your Murray riding mower on a level part of your driveway or garage floor. Avoid changing tires on the lawn. The jack or jack stands can sink into the ground, making removal or reinstallation of the tire difficult. 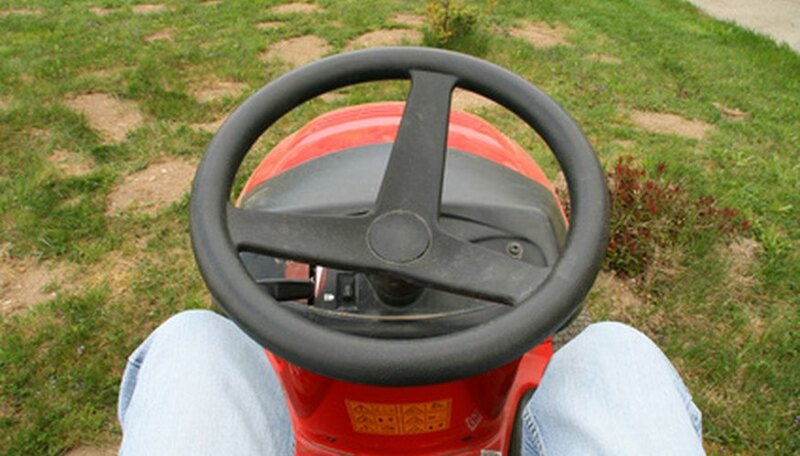 Place a block of wood on each side of the tire on the opposite end of the mower that you will be working. Place one block in front of the tire and one block in back of the tire. Position the floor jack under the middle of the front frame, if you are changing the front tire. If you are changing the rear tire, position the jack under the rear frame. Raise the mower with the floor jack until the bottom of the tire is off the ground. Put a jack stand on each side of the jack under the frame. Adjust the jack stands so that they make contact with the mower frame. Lower the mower with the floor jack until all the weight of the mower is on the jack stands. Remove the plastic cap in the center of the rim. Use a pair of pliers to twist the cap away from the rim. When removing front tires, bend the retaining cotter pin straight with a pair of pliers and pull the cotter pin out of the axle. Rear tires use a retaining ring; pry it off with a flathead screwdriver. Remove the square key that is in between the axle and the rim with a pair of vise grips, if you are changing the rear tire. Do not lose the key, because it is necessary for reinstallation. Lay the tire and rim on a flat surface. Remove the cap from the valve stem and press a flathead screwdriver in the middle of the valve stem to release the remaining air. Remove the tire from the rim using two crowbars to pull the tire beads from the rim. Insert one crowbar between the upper tire bead and the rim and pry up until you can insert the second crowbar. Insert the second crowbar and pry up and then slide the crowbar around the circumference of the rim to completely remove the upper bead. Remove the opposite side of the tire the same way. Place the new tire onto the rim using the crowbars to pry the tire over the rim. Use care when doing this so that you do not damage the tire. Brush tire bead seal around the outside beads of the tire using a small brush. Wrap a ratchet strap around the circumference of the tire and tighten the strap until the tire bead walls make contact with the rim on both side. Begin filling the tire with air as you slowly release the ratchet strap. Once the tire is halfway full of air, remove the ratchet strap. Finish filling the tire with air to the recommended PSI on the sidewall of the tire. Place the tire over the axle. If you are working on a rear tire, position the notch on the inner rim with the notch on the axle. Tap the square key into the notch with a hammer. Place the retaining ring over the axle to secure the rear tire. On front tires, place the cotter pin back into the axle and bend the ends to secure the tire. Snap the plastic cap over the end of the axle. Raise the mower with the jack just enough to remove the jack stands. Lower the mower to the ground and remove the wood blocks.